Join us for a screening of The Giver starring Jeff Bridges, Meryl Streep, Alexander Skarsgard, Katie Holmes and Taylor Swift. The book this film is based on won the 1994 Newberry Medal and has sold more than 10 M copies worldwide and is on many middle school reading lists. A 2012 survey based in the US designated it as the fourth-best children’s novel of all time. 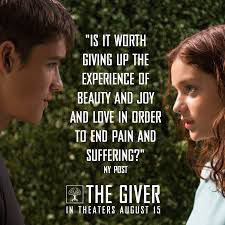 In a seemingly perfect community without war, pain, suffering, differences or choice, a 16-year-old boy is chosen to earn from an elderly man about the true pain and pleasure of the “real” world. Run time 97 minutes, rated PG-13. Always popcorn!